Fernando Seguignol and Takaaki Ishibashi reliving their favorite scene from the movie “Major League” last Friday at QVC Marine Field. 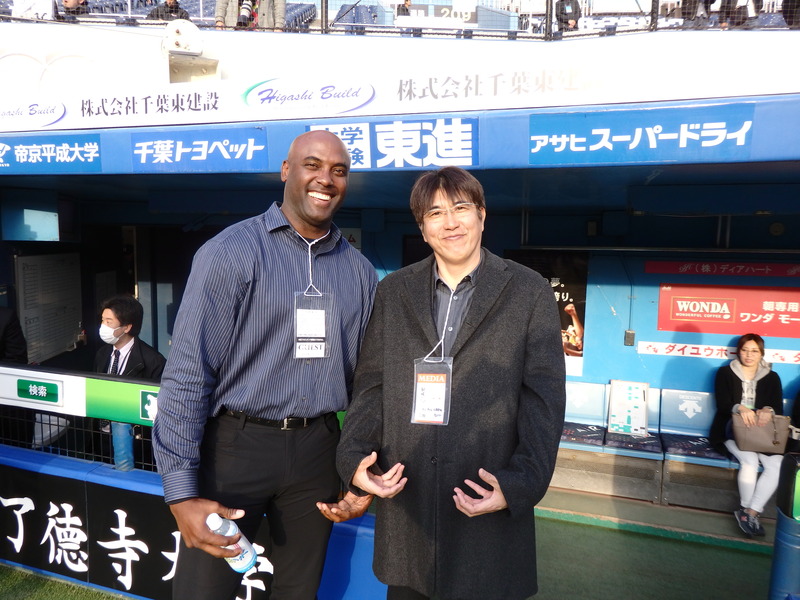 It was great catching up with Fernando Seguignol the other day at QVC Marine Field before the Chiba Lotte Marines opened the season against the Nippon Ham Fighters. As we were talking on the field, I noticed Takaaki Ishibashi was a few feet behind us in front of the visiting dugout, where he had his picture taken with Fighters cleanup hitter Sho Nakata. So I asked Segi if he wanted to have his picture with Ishibashi, to which he replied, “I saw it 12 times,” and proceeded to mimic Ishibashi’s iconic pose from the movie. Ishibashi was gracious to pose with Segi as you see. The Yomiuri Giants are NPB’s only undefeated team after the first weekend of games, having swept the Central League champion Yakult Swallows at Tokyo Dome. The Pacific League’s Seibu Lions and Chiba Lotte Marines had a shot going into Sunday, but each dropped a one-run decision. A year ag0, the Orix Buffaloes opened their season to the highest of expectations, only to be swept in three straight at Seibu Prince Dome. Brandon Dickson, who a year ago filled in for rehabbing ace Chihiro Kaneko, allowed a run in seven innings on Opening Day as the Buffaloes suffered a 1-0 loss. Dickson was back on the mound a year later trying to keep the Buffaloes from being swept again. The 1.95-meter right-hander was unable to hold his early three-run lead with his control off and the Lions able to hit ground balls around shortstop Hiroyuki Nakajima, who looked really good when he could drop to one knee, scoop up a grounder hit straight to him and snap a throw off to second. When forced to get good jumps and reads, he looked like it had been four years since he was the Lions’ regular shortstop. 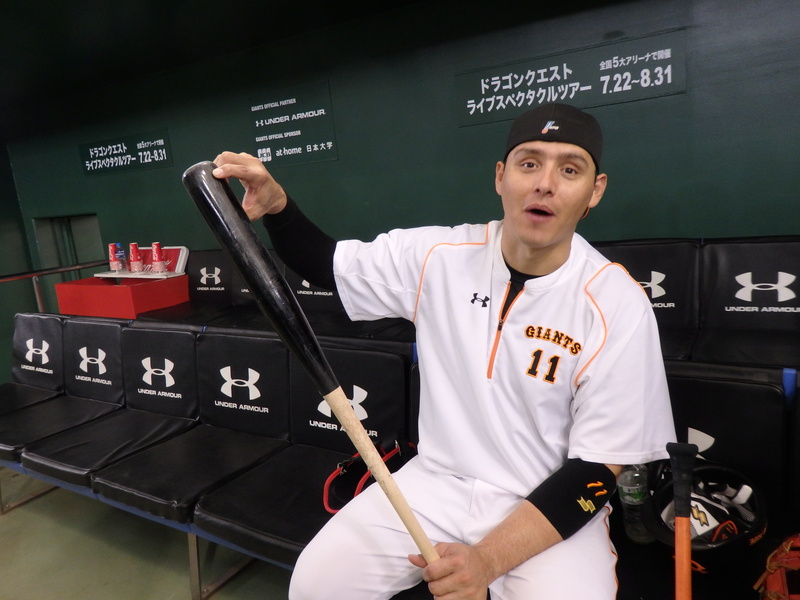 Luis Cruz sat in the Yomiuri Giants’ dugout on Saturday explaining that he lacks the power to hit home runs when he just barely misses the sweet spot –showing the mark on his bat left by his seventh inning double on Opening Day. Cruz just missed on Opening Day, but launched a three-run homer 15 rows back in left on Saturday afternoon. The Giants got past the Swallows 3-1 on Friday and pretty much embarassed the Central League champs 10-5 on Saturday in their first two games under Yoshinobu Takahashi. In Hiroshima, new DeNA BayStars skipper Alex Ramirez got his first win, a 2-1 decision over the Carp, who started 2015 CL ERA leader Kris Johnson. The BayStars got a two-run single from rookie second baseman Tatsuhiro Shibata and seven scoreless innings from Shoichi Ino, who was named to fill in on Opening Day just a few days before. The Carp recovered the next day, when Hiroki Kuroda got hit but gutted it out with runners in scoring position to hold DeNA to just a run in seven innings. One of Ramirez’s two priorities has been to sharpen his catchers’ pitch-calling skills and improve situational play. They lost the second game at Mazda Stadium 3-1 , so the situational hitting seems to be just as big a problem for both teams, as it was for the Carp last year. In Osaka, future Hall of Famer Tomoaki Kanemoto split his first two games in charge of the Hanshin Tigers, winning 7-3 on Saturday after dropping Friday’s opener 5-2 to the Chunichi Dragons. The big star of the series so far has been Chunichi’s Cuban first baseman Dayan Viciedo, who was 2-for-5 with a two-run jack in the opener and 3-for-4 with a solo homer the following day. In the Pacific League, the SoftBank Hawks pursuit of a third straight Japan Series championship began with a loss in the Sendai home of the Rakuten Eagles, who finished last in each of the previous two seasons. Hawks “Ace” Tadashi Settsu got hammered for six runs in five innings in the opener, in which Jonny Gomes made his Japan debut with two runs and three walks in a 7-3 as veteran skipper Masataka Nashida won his first game with his third club. The Eagles came from behind in the eighth inning against Rick van den Hurk in the second game, which ended in a 3-3 tie after finishing the maximum 12 innings. Zelous Wheeler, playing in left for the Eagles, made a gutsy catch in the 10th inning to put the damper on the Hawks’ best late-inning scoring opportunity. Alfredo Despaigne was one of the heroes of both of the Chiba Lotte Marines’ first two wins over the Nippon Ham Fighters in Chiba, driving in the game-winning run in both games. The Marines got three early runs off Shohei Otani, who was hitting 160 kph (99 mph) despite a temperature at game time just above freezing. The Marines took the opener 3-2, and came from behind to win the next day 6-4, in which Despaigne — having attended his first spring training in his third Japanese season — went 3-for-4 with two doubles. After setting Japan’s single-season hit record last season, with the media making the necessary fuss about his hit total, one wonders if anyone was put out by the Seibu Lions’ Shogo Akiyama only getting an RBI double on Friday but drawing three walks and scoring two runs in the Lions’ come-from-behind 5-4 victory over the Orix Buffaloes at Seibu Prince Dome. Akiyama was back “in form” the next day, when the Lions overcame a 5-0 first-inning deficit to beat the Buffaloes 9-5 with Akiyama scoring twice again, but this time with three hits — probably to the great relief of those who want to write about whether he can break his own record this season.